Don't let that first track - performed entirely on smooth-toned flute over which an equally smooth if lugubrious voice sings - fool you into thinking that this recording will be a pleasant and comfortable ride: Rigor Sardonicous are back with their scum-encrusted deathly doom guitars and distinctive swamp-monster take on death metal vocals. I can well believe the story about one of the RS members being a director of a funeral parlour as the strings fairly heave under thick layers of grime and black slurry and the groaning vocals are so deep and gritty that singer Joseph J Fogarazzo must have a bird's digestive system, complete with gizzard which holds stones to grind up food, to help him produce such dreadful tones. One thing that has changed since I heard previous RS album "Principia Sardonica" is that the percussion and especially the cymbals are more under the musicians' control and less likely to sound like cheap wacky saucepan lids: this helps to make "Vallis ex Umbra de Mortuus" a more accomplished work to be taken seriously (which means it's also less humorous than its predecessor album). You might expect that for a band whose music can be slower than a snail on sedatives, this should be a long album of few tracks but "Vallis ..." is surprisingly short at 39 minutes with 8 tracks. One song "Alveus de Somnus" is also quite fast, the rhythm being buzzy all the way through and the percussion maintaining a constant if monotonous beat so the song has a very military air. The pace of the music otherwise varies from super-slow on "Siens Somnium" to moderately paced on some of the tracks past "Alveus ...", though this is a fairly general observation as quite a few songs, even "Siens Somnium", can have a varied speed due to changes in rhythm. The musicians favour a riff-based approach with the instruments sticking fairly close together in melody and rhythm and the drumming sounding very deceptively simple. On a couple of tracks "Incompertus quod Anon" and "Laudare Apocalypsis", the cymbals can be off-kilter but these are the only tracks where this occurs. The guitars are continuously grinding throughout all songs and the riffs and melodies are clear enough though not very immediate or memorable. Fogarazzo's singing doesn't vary much in range (it never rises above super-deep) or speed: no matter how fast or slow the actual music is, the vocal delivery maintains its usual relaxed pace and flow. Needless to say, you can hardly make out any actual words which tend to pour through Fogarazzo's lips like heavy thick lava. The best tracks include the speedy "Alveus de Somnus", the lumbering "Incompertus quod Anon" and the creepy "Laudare Apocalypsis", these last two sounding quite balanced and in-tune despite the cymbals work. The appropriately named "Agony" is a ponderous work with elephantine drumming and Fogarazzo's strange, almost burping-noise vocals really crawling caterpillar-like under your skin. The song goes into a weird hulking caveman groove for a short while which in my view earns that track extra brownie points. 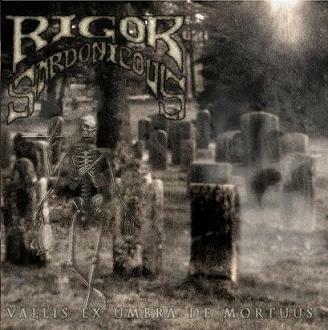 Very much for the fans only, this recording: Rigor Sardonicous definitely make no concessions for those of tender heart or queasy stomach and certainly not for people who want to hear singing that is recognisably human and which doesn't flow or pour out like lumpy tarry slag from a vent in some disused polluted mine. The music can be monotonous (especially those vocals) and have a crushing effect on the ears and mind. It's not nearly as entertaining as "Principia Sardonica" though - I get the feeling RS want to be taken a bit seriously here with an efficiently made funeral death doom album and have cut out a lot of the black humour that gave the earlier album a fruitcake aspect.